PRESENTER MEMBERSHIP: All persons selected to present an oral or poster abstract at the 2019 VCS Annual Conference must be a current VCS member, or sponsored by a current VCS member, by June 16, 2019 or the abstract will be rejected prior to grading. VCS SPONSORSHIP: A VCS member may only sponsor ONE non-member abstract. These members will be contacted to verify their sponsorship. Non-member abstracts without VCS sponsorship will be rejected. VERIFY MEMBERSHIP: Verify your membership by logging in to your account at https://netforum.avectra.com/eWeb/DynamicPage.aspx?Site=VCS&WebCode=IndSearch. Contact vetcancersociety@yahoo.com to request verification of membership status if necessary. JOIN/RENEW MEMBERSHIP: To join or renew your membership in VCS, click here: JOIN/RENEW ONLINE. CONCURRENT ABSTRACT SESSION ON FRIDAY: There will be three concurrent morning sessions and three concurrent afternoon sessions on Friday, October 18th only. Those wishing to submit an abstract for consideration in one of the six themed sessions should visit THIS PAGE for more details. Abstracts submitted after March 31st, or that aren’t accepted in one of the Friday themed sessions, will be graded and considered for an oral or poster presentation elsewhere in the schedule. RESIDENT ABSTRACTS: All abstracts submitted by residents and selected for ORAL presentation will be presented on Thursday afternoon. No resident abstracts will be selected for Friday concurrent sesssions regardless of the topic. Resident abstracts selected for POSTER presentation will be presented on Saturday morning. ABSTRACT PRESENTATION RESTRICTIONS: All abstracts, oral or poster, must be presented by an investigator on the project and cannot be presented by a sponsor unless they are directly involved in generating (not just analyzing) the data. DISCLOSURE SLIDE: Every presentation must include a disclosure slide at the beginning or end of the presentation. You must disclose any sources of funding required to complete this work. The sources will be included in the printed proceedings. PRESENTATION METHOD: While you may submit multiple abstracts for this conference, generally each person will be allowed to present one oral abstract and one poster abstract. When submitting your abstract you will be asked for your preferred presentation type. You may select POSTER ONLY or EITHER POSTER OR ORAL. You will be unable to select ORAL ONLY. You will be asked if you will allow the program chair to change your presentation to the other method if necessary. If you request POSTER ONLY, and your abstract is accepted, you will only be selected for a poster presentation. AUTOMATIC REJECTION: Single case reports will be automatically rejected. Also, any abstract with “data to be presented” or some iteration of this will be refused. LENGTH AND FORMATTING: The abstract limit of 250 words should be based on the word count from your word processing software. Our submission page may allow more words to account for hyphens or other characters. Please do not rely on the submission page word count as this could jeopardize future submission of the final manuscript for publication. VCS reviewers will not oversee or check the final word count. The body of the abstract must be 250 words or less among all four sections (not including the title, all authors, affiliations and references, if any. Do not include that information in the abstract body). The abstract should include an introduction with study objectives, a brief description of the materials and methods, results and conclusions of the study. Abstracts may not include tables or graphs. No editing will be done by conference staff. Each author is fully responsible for the content of the abstract. It is best not to copy and paste abstract content into the system as irregular symbols and characters result when merging for publication. If using Greek characters, it is best to spell out the symbol as those characters don’t often merge correctly. SUBMISSION DEADLINE: All abstracts must be submitted online by June 16th. Within the application, follow the prompts to complete the demographic information, university affiliation, presentation type, etc. Abstracts must include results and conclusion. Once the abstract information has been entered, press the Save and View Abstract button to review your submission and complete the application process. EDITING YOUR ABSTRACT: After you successfully submit your abstract you will receive a confirmation email letting you know that it has been accepted. This email will contain a link that will allow you to EDIT your abstract as often as you’d like up to the submission deadline of June 16th. Please DO NOT resubmit the same abstract. No changes, other than a presenter name, institution and email address will be made to your abstract. GRADING: All submissions will be reviewed and graded. All submitters will be notified of their acceptance or rejection via email by July 10th. Those selected for oral or poster presentation must accept or reject their assignment no later than July 17th. Does the study present new information? Is the study design clear and appropriate? Is the objective/hypothesis of the study clearly stated? Is the abstract clearly and concisely written? Are the study conclusions supported by the abstract content? ORAL PRESENTATION: Oral presentation slots are a total of 15 minutes (12 minutes for presentation plus 3 minutes for Q&A). Although your presentation must be uploaded prior to the conference, we encourage you to bring your presentation on a flash drive. If you must use a MAC, you must bring your own computer and adapter. ORAL PRESENTATION SIZE: Be sure to format your presentation using 16:9 dimensions. We will be utilizing WIDE SCREEN projection. RESIDENT POSTERS: This year, the poster presentations and viewing will take place on Saturday morning, October 19th. Residents who are presenting a poster will provide a brief (no longer than 2 minutes and only one powerpoint slide) announcement to improve visibility of their work. A template will be provided to those selected for poster presentation. During the first 30 minutes of the poster session, residents will approach the microphone and give a brief statement with the following format: name, title of project, important aspects of study design, major conclusion, and location of poster. UPLOADING PRESENTATIONS PRIOR TO CONFERENCE: All presentations for all abstracts accepted for oral presentation must be uploaded by 11:59 pm on October 15th. Instructions for uploading presentations will be emailed to all presenters via email in early October. The link provided will be specific to the speaker and their specific abstract so presenters may not share the link with others. Microsoft PowerPoint 2013 on a PC format will be the only platform supported for the conference. PRESENTATION DURING THE CONFERENCE: If your abstract is accepted for oral presentation, you must agree to present at any time during the conference. Oral abstract presentations will be scheduled through 5:00 pm on Saturday, October 19th. CONFERENCE REGISTRATION: All those who have agreed to present an assigned abstract must be registered for the conference by August 15, 2019 or the abstract will be removed from the proceedings. The presenter may still present his or her abstract should they register after August 15th, however, the abstract will NOT appear in the proceedings. All posters MUST be 3’ wide x 4’ tall (.914m wide x 1.2192m tall). This is considered a VERTICAL poster. No other sizes will be accepted as two posters must fit side by side on the board. You may present only ONE poster . Posters may be displayed once you have checked into the conference at the registration desk. All posters should be in place no later than 3 pm on Thursday, October 17th. Currently, poster presentations are scheduled for Saturday, October 19th from 10:00 am until 12:00 pm. 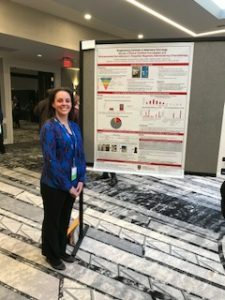 Residents who present a poster will make a less than two minute “oral introduction” to their poster on Saturday morning at 10:00 am and then are required to stand with their poster during the poster presentation period following. Residents may also show ONE slide during this oral introduction. A template for the slide will be provided.If more judging time is needed, residents presenting a poster may be asked to remain with their poster. Graders will have no knowledge if an abstract submitted belongs to a Resident. Resident oral abstracts are scheduled on Thursday afternoon, October 17th. All submissions will be graded on merit and completeness of research data. Resident awards will be presented at the closing event on Saturday evening at the Houston Space Center. Residents who accept awards must be prepared to present their papers at ACVIM in 2020 and submit their abstract by the published deadline. There are four available awards for Resident abstracts, each worth $2000. You must be a VCS member Resident to be eligible for any of the four awards. Based on the scores given, an award may be presented for the best oral and poster clinical science abstracts and the best oral and poster basic science abstracts. The award will be used to compensate the winner for travel related expenses associated with attendance at the 2020 ACVIM Forum. Please wait until you have received your assignment before registering for the conference. Only CURRENT VCS members may use the MEMBER RESIDENT PRESENTER RATE. Non-member Residents selected to present orally or a poster must use the non-member Resident registration rate. Non-member residents will not be judged and will not be eligible for awards. SUBMISSION DEADLINE: The deadline for abstract submission is 11:59 PM (CST) June 16, 2019. No exceptions will be made. CONTACT INFORMATION: Please contact Sandi Strother at vetcancersociety@yahoo.com with any questions regarding your presentation. If you have technical issues, please contact Lee Fent at lee.fent@gmail.com.